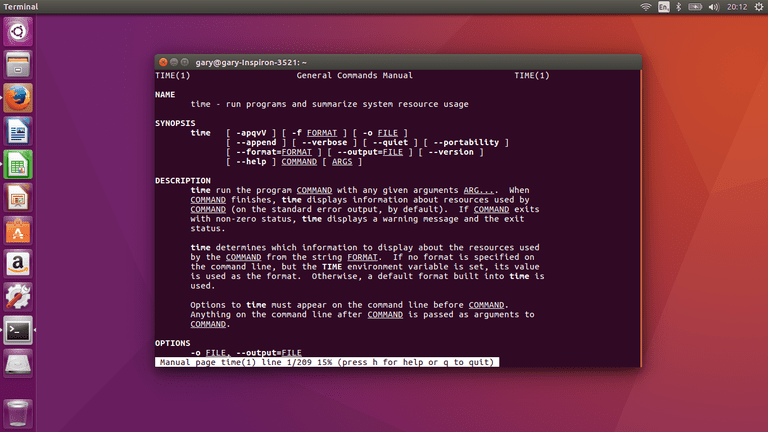 The time command is one of the lesser known Linux commands but it can be used to show how long a command takes to run. This is useful if you are a developer and you want to test the performance of your program or script. This guide will list the main switches that you will use with the time command along with their meanings. For example, you can run the ls command to list all the files in a folder in a long format along with the time command. The statistics shown show the total time is taken to run the command, the amount of time that was spent in user mode and the amount of time spent in kernel mode. If you have a program that you have written and you want to work on the performance you can run it along with the time command over and over and try and improve on the statistics. By default, the output is displayed at the end of the program but perhaps you want the output to go to a file. All of the switches for the time command must be specified before the command you wish to run. If you are performance tuning then you may wish to append the output from the time command to the same file over and over so that you can see a trend. time -f "Elapsed Time = %E, Inputs %I, Outputs %O"
You can mix and match the switches as required. time -f "Elapsed Time = %E \n Inputs %I \n Outputs %O"
What Does the Linux Command Time Do?